Carbon monoxide (CO) is the number one cause of poisoning deaths in the U.S. A colorless and odorless gas, CO is a byproduct of combustion. That’s why you should never use a charcoal grill in the shed, or leave the car running in the garage. That’s also why it’s so important to properly vent fuel-burning major appliances like furnaces, water heaters, clothes dryers, ovens and ranges. If you’re in the market for a carbon monoxide detector, the two most important feature options to weigh in your decision are power source and display. Carbon monoxide detectors come in three varieties: hard-wired, plug-in, or battery-operated. Hard-wired models have the advantage of being linked to each other, but if the electricity goes out, so does the detection system. (Any hard-wired unit should include a battery backup.) Battery-operated units are much simpler to install and will not fail in a power outage. Plug-ins with battery backups are readily available, but given that gases rise, the standard placement of electrical outlets (near the floor) makes them imperfect receptacles for CO detectors. In any case where batteries are involved, remember t0 replace them every six months. The display on a digital carbon dioxide detector shows the concentration of CO in parts per million. Some models even feature a continuous stock ticker-like readout of the current level. A display that includes a timeline history of your home’s CO concentration can be helpful in assessing or identifying dangers. • Check your county/town regulations regarding types of alarms and placement. Codes differ from place to place. • Check the package to make sure the product meets UL Standard 2034. • Consumer Reports suggests testing your alarm weekly and vacuuming it monthly. • In general, detectors should be placed on the ceiling or high on the wall. Do not place them within 15 feet of cooking or heating appliances. Likewise, avoid placement near ceiling fans, vents, or air conditioners. Install detectors on each level of your home, including the basement. Ideally, there should be one within ten feet of each bedroom door. 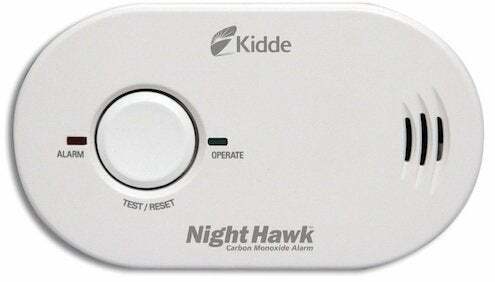 Carbon monoxide detectors start at about $35. For a professionally installed hard-wired model, you might pay as much as $250. No matter what type you buy, any CO detector is better than none at all. Installing one could save a life.